Below please find a 13F analysis report for Paulson & Company for Q1 2009. 13F analyses are reports that fund managers with over $100M are required to submit to the SEC, they are publicly available and these reports provide us with some insights on what some hedge fund managers have been investing in. Paulson & Co. (PCI) is an employee owned hedge fund sponsor. 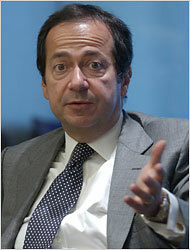 Founded by John Alfred Paulson, the firm primarily provides its services to pooled investment vehicles. The firm invests in the public equity markets across the globe and employs strategies such as merger arbitrage, long/short, and event-driven strategy to make its investments. It employs fundamental analysis to make its investments. Paulson & Co. was founded in July 1994 and is based in New York, New York. Using the TickerSpy portfolio analysis tool the graph to the left was created showing the approximate equity performance for Paulson & Company over the previous six months. According to this analysis Paulson & Company‘s equity picks have been underperforming against the S & P 500 recently. According to AlpaClone data on Paulson & Company 26% of their equity portfolio is invested within the Health Care sector and 40% in Financial. The total equity value of Paulson & Company is 9B+, their total number of reported holdings is 25, and over 89.7% of the market value of this portfolio is represented within the top 10 holdings. For more information on Paulson& Company please see the HedgeFundBlogger.com Hedge Fund Tracker Profile on Paulson & Company by clicking here.